So much of what we see on television, advertisements and movies highlights impossibly thin, muscle-sculpted bodies that few people really have. The happiest people we know are the ones that are happy with who they are. What’s more fun that spending time with other happy, accepting people? Chub Cruises seems to be filled with happy guys of all ages who value body acceptance. If you are a plus-size man or someone who is attracted to plus-size men, Chub Cruises has a great group of guys for you to meet while enjoying a Caribbean cruise. We asked Chub Cruises to tell us more. This is what Captain Jacob told us. How would you describe Chub Cruises in one sentence? Chub Cruises organizes awesome group cruise vacations for chubby gay men and their admirers. What is unique about Chub Cruises? Chub Cruises is the only group cruise created specifically for the gay chub and chaser community. In many vacation situations, gay males who are attracted to the chubby physique have been frowned upon by friends or onlookers making it uncomfortable for an admirer to express their true attraction to plus size men. Sailing with Chub Cruises provides a supportive environment of like-minded travelers who can focus on enjoying the moment of fun, entertainment, and camaraderie with dignity and respect. That means that large gay men and their admirers don’t have to feel out of place, self-conscious, or on the fringe of a group. This is THEIR cruise. When scheduling a new group cruise, we research cruise lines and cruise ships that provide the best experience for big guys. Seemingly small details, like chairs without armrests, can make big guys much more comfortable. We also offer lots of exclusive Chub Cruises gatherings and activities before and during the entire cruise. Our group environment is friendly, non-judgmental, and we do our best to ensure everyone has an amazing vacation. 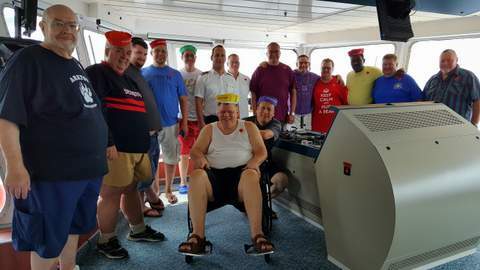 There are other wonderful chub and chaser events on land, but a Chub Cruise gives our community the opportunity to spend lots of time together and develop deep connections and friendships. From enjoying a gourmet dinner together, to taking in a Broadway style show, or exploring an exotic port, our sailors have a chance to create lifetime memories. Most of our travelers (or Sailors) identify as gay chubs, chasers, or bears; but we are an open welcoming group and we invite anyone that would like to join our friendly group. We have a mix of married couples and singles, and ages range from 20’s through 70’s. What cruises are coming up? Our next cruise is a Western Caribbean cruise starting in Fort Lauderdale and then traveling to Key West, Costa Maya, Cozumel, and Grand Cayman. We’ll be sailing from January 7-14, 2018 aboard the magnificent Celebrity Silhouette. January is a great time to get away from the winter and enjoy this tropical paradise itinerary that includes popular gay destinations. The Celebrity Silhouette has also won many cruise ship awards and Celebrity has a great track record with LGBT travelers. For more information, visit www.ChubCruises.com.